A visitor information sign explains to visitors the history behind the Native Indian pictographs of Agawa Rock in Lake Superior Provincial Park, Ontario, Canada. A visitor information sign stands next to Agawa Rock in Lake Superior Provincial Park in Ontario, Canada. Agawa Rock is an archeological site with a fascinating collection of Native Indian, the Objibwa, rock paintings or pictographs. The pictographs give great insight into Native Indian history dating back many centuries and they are even more spectacular considering their location, rising 98 feet above the surface of Agawa Bay, Lake Superior. 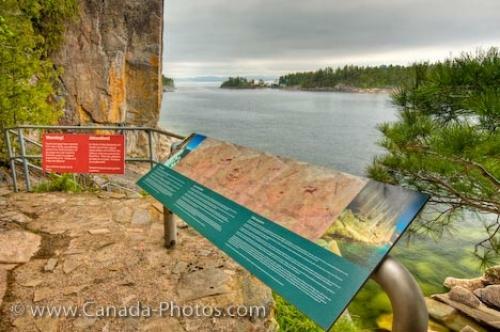 Photo of a sign explaining the Native Indian history behind the pictographs of Agawa Rock, Lake Superior Provincial Park. Pictures from photo gallery "Lake Superior Pictures"
This picture is part of the photo album "Lake Superior Pictures" - there are more beautiful images waiting for you. ... The staff of Lake Superior Provincial Park are pleased to share their expertise with the visitors. The location of the pictographs is sacred where the Objibwa came to record their dreams and visions with an iron-based pigment made from powdered hematite and animal fats on the flat surface of Agawa Rock. The cliff is formed of a slab of crystalline granite which contrasts well with the rusty coloured paintings. Some 35 paintings are on the rock, figures of canoes, a heron, a bear, and a horse amongst others. The horse was not introduced to the region until after the 17th century but the other figures are thought to be representative of clan symbols. Tradition has it that the creators of these pictographs would have fasted for several days until they dreamt or had a vision which they then made permanent on Agawa Rock. The Agawa Rock pictograph site is one of the most popular archeological sites in Canada. Lake Superior Provincial Park covers some 1,550 square kilometres (600 square miles) along the northeastern shore of Lake Superior. Access to the Park can be gained from several gated entrances along the Trans-Canada Highway which runs through the park. Aside from the pictographs, Lake Superior Provincial Park is home to many animals: moose, black bear, cariboo, deer and wolf and the tourists interested in photography will find many fascinating scenic opportunities for their hobby. There are several campsites within the Park with varying levels of conveniences and visitors will find the amphitheatre presentations by Park Staff very interesting. Sign next to Agawa Rock along the Agawa Rock Pictographs Trail, Lake Superior, Lake Superior Provincial Park, Ontario, Canada. I photographed this photo with the digital SLR camera model Canon EOS-1Ds Mark III, aperture of f/16.0, exposure time of sec. on ISO 100, as always I used a original Canon Lens, the focus lenght for this picture was 25mm.